We have identified a purple-skinned, yellow-fleshed specialty-type potato that we believe has great potential for growers interested in raising specialty-type potatoes. This clone, designated B1816-5, was bred by Dr. Kathy Haynes, USDA-ARS, Beltsville, MD. We are conducting cooperative research with her and others in NC and elsewhere to evaluate the market potential of B1816-5. Certified foundation seed of B1816-5 is being increased at Cornell University’s Uihlein Farm in anticipation of variety release. B1816-5 has been displayed at the Specialty Crops Field Day at the Cuningham Research Station (CRS) since 2002 and has been received favorably each time as it is very attractive and well adapted to NC’s environment. Fund from the SCP have enabled us to get this clone into the hands of several large and small growers who are evaluating the market potential of this clone and other specialty-type potatoes. The purple skin and golden flesh color of B1816-5 have a particular attraction to some in eastern NC (e.g. 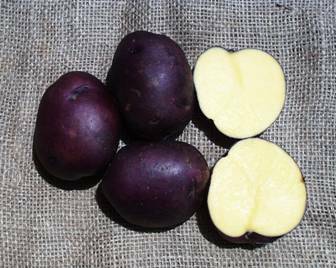 alumni of East Carolina University whose school colors are purple and gold) and we believe that with appropriate marketing this new variety could be readily sold to restaurant chefs and/or those who would typically buy the higher priced gourmet potatoes. The increased nutritional content of yellow fleshed potatoes (they provide over 40% of the RDA of vitamin C) and the fact that most yellow-fleshed potatoes contain higher levels of lutein, a carotenoid plant pigment that has been shown to reduce the risk of macular degeneration and is thought to reduce the risk of heart disease, can be used to enhance their marketability. In addition to B1816-5, we are evaluating several other specialty-type potatoes in NC and anticipate that several of these will also be adopted in the future contributing to the diversification of small and large farms in rural eastern NC. Potatoes in eastern North Carolina (NC) are currently grown to meet the needs of two very important spring markets. The first is the chipping industry that comprises roughly 60% of NC’s crop. The other is the table-stock market comprised of round white and red-skinned table-stock potatoes. Within the table-stock market there exists a demand for specialty-type gourmet or novelty potatoes to serve not only restaurants, but the individual consumer as well. The objectives of this research are develop specialty-type potato varieties for use in NC. Four variety trials (2 on-farm and 2 research station trials) were established to evaluate the performance of conventional table-stock, processing and specialty-type potatoes such as B1816-5. The CRS SCP trial had 13 clones. All except two were either purple- or red-skinned table- or specialty-type potatoes. The NE-1014 Regional Potato Variety Development Project Red Variety Trial (NE-RD) had 24 red and purple varieties. The James Brother’s trial included 13 white (5 yellow flesh), 1 purple and 4 red clones. The McCotter trial included 12 whites, 1 purple and 2 red clones. All trials were planted in a randomized complete block design with 4 replications. Plots consisted of one row with 28 hills spaced 9 inches apart. Spacing between rows was 38 inches at all sites, with the exception of the James Brother’s Trial, which was on a 40 inch row spacing. The on-farm trials and the SCP were dug using a single-row digger and hand harvested. The NE-RD trial was harvested using a two-row harvester modified to dig one row at a time. Both grower trials were graded using a portable Lockwood Grader which sorts to two grades: A+B’s ≥ 1 7/8”; and C’s < 1 7/8”. The NE-RD and the SCP were graded to five classes: 1’s < 1 7/8”; 2’s > 1 7/8 to 2 1/2”; 3’s > 2 1/2 to 3 1/4”; 4’s > 3 1/4 to 4”; 5’s > 4”. Culls were removed and weighed separately in all trials. Each clone was evaluated for tuber quality and appearance during grading using standardized NE-1014 rating codes. A description of the rating codes is provided in Appendix 1. Generally, we place our most promising varieties in this trial because growers and allied industry members visit this site in May during the half-day Potato Tour held during the Annual Meeting of the NC Potato Association, held in Elizabeth City. Because of the diversity of materials in this test (we plant processing, table-stock and specialty-type lines to appeal to a broad audience) three standards for yield are compared: Atlantic (round white processing standard), Chieftain (red table-stock standard), and Yukon Gold (yellow-fleshed specialty-type standard). The most interesting red-skinned and/or specialty-type clones in this trial were: B1816-5 (purple-skinned, dark yellow flesh); Vivaldi (buff-skinned, yellow flesh); and NY129 (red-skinned, white flesh). B1816-5, Vivaldi and NY129 had a marketable yield of 239, 170 and 161 cwt/A, respectively. B1816-5 was given a 7 for overall appearance, while Vivaldi and NY129 were rated 6 and 5, respectively. None of these clones had any problems with internal heat necrosis (IHN), which can be a significant quality limitation in the mid-Atlantic region. Overall, from a specialty-crop perspective we were very favorably impressed with the performance of B1816-5 and Vivaldi, and we anticipate that several growers who saw these materials in this trial and elsewhere will try planting them in 2005. The breeding program is facilitating the distribution of the very limited amounts of seed of B1816-5 at this point. Vivaldi, a clone developed and marketed by HZPC Americas Corp, Presque Isle, Canada, has arranged to have several growers in the Elizabeth City area to plant 5-10 acres of this clone and they are facilitating marketing. Yields in this trial were lower than what we have seen in past years. This was due, in large measure, to the lack of rainfall throughout the growing season. B1816-5, MSI005-20Y, ND3196-1R, NY125, NY129, Yukon Gold and Vivaldi were the yellow-fleshed table-stock, red-skinned and/or specialty-type lines entered in this trial. From a specialty-crop perspective B1816-5 and Vivaldi were standouts with marketable yields of 169 cwt/A and 178 cwt/A and overall appearance scores of 6 and 8, respectively. As in the James Brother’s trials, neither of these clones had internal problems. We were hoping that ND3196-1R might be a good purple-skinned clone, but its yield was low and it had a very poor overall appearance score (3). This trial was specifically designed to focus on reds, purples, and other specialty-type potatoes that we believe may fill various niche markets in our state. None of the clones in the trial significantly exceeded the standard yield of Chieftain (157 cwt/A). Two clones, however, did have greater yields [B1816-5 (171 cwt/A), and La Rouge (179 cwt/A)]. As in the other trials B1816-5 performed very well. Yukon Gold was assigned the best overall appearance score at a 7, while B1816-6 was rated a 6. No internal defects were observed in B1816-5, but we did observe a significant amount of silver scurf on this clone, which can be controlled to some extent by seed treatments. Another interesting clone that was evaluated in this trial was the russet variety Amey. Amey was recently released by the USDA-ARS in cooperation with several eastern states including NC. We call Amey a “baby russet” because this variety produces a good crop of small to medium-sized russet potatoes that are very attractive in appearance and very tasty. We think that there may be a market for this so-called “baby russet” as growers and consumers become more familiar with it. However, it is worth noting that Amey had the highest percent IHN levels at 10% observed in this trial, but the IHN severity rating was not exceptionally serious with an IHN rating of 8. Of the twenty-three clones in this trial none of them had a higher marketable yield than the standard Chieftain (177 cwt/A). But it is important to note that over 53% of the tubers sampled in Chieftain had severe IHN. NDTX731-1R was the only clone to have an overall appearance rating of 8, while B1816-5 was assigned an appearance score of 5, which was largely due to the presence of silver scurf. Several other very attractive red-skinned clones were: B2066-3; B2079-6; Dark Red Norland; and ND8089-2R, each of which was assigned an overall appearance rating of 7. B2066-6 and B2079-6 were selected in Maine during our potato harvest for their ability to produce a crop of small “B-sized” potatoes and they appear to do this very well. We hope to evaluate them next year in other trials. B1816-5 (Fig. 1) has an attractive dark purple skin and yellow flesh. We believe that it has significant potential in NC but growers will need to control silver scurf on it if they are to achieve it’s potential. Silver Scurf is a fugal pathogen on the surface of the potato that does not affect internal quality, but it can detract from appearance. B1816-5, like many other red- and purple-skinned varieties, is susceptible to silver scurf so this disease is not new to potato producers, especially those accustomed to producing red varieties. Treatment with a fungicide at planting can minimize the presence of this pathogen. In 2004 we distributed about 120 lbs to two very different local growers. Ferebee Farms located in Camden County (a large grower) received 100 lbs and had very positive things to say about B1816-5. Their farm manager brought it to a restaurant trade show in Chicago, IL where it also received favorable reviews. Our other grower, Kenneth Waters, is a small grower with a roadside stand near Chocowinity. He too commented on its quality and the ready acceptance by local consumers. He noted that a couple of higher end restaurants in the area were interested in using it during 2005. During 2005, we will have roughly 300 to 400 lbs available and will attempt similar efforts to put small quantities of B1816-5 seed in the hands of growers allowing them to evaluate and develop markets for the clone. Michigan Purple (Fig. 2) was in the CRS SPC trial in 2004. It is a high yielding purple-skinned, white-fleshed potato. We consistently rate this clone with a low appearance score, but this is largely due to excessive skinning and its high susceptibility to scab. 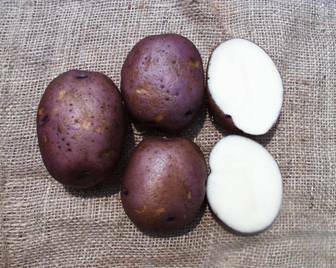 Growers (organic and conventional) who take special precautions to minimize skinning and do not have scab problems, and/or home gardeners who hand harvest potatoes might be the appropriate market for this unique potato in NC as it is flavorful, and it’s smooth light purple skin and white flesh are very attractive. Amey (Fig. 3) is an attractive “baby russet” potato intended for table markets. This variety was released by the USDA-ARS in 2001. Our program has included this variety in 14 trials since 1995 but only in the SPC trial in 2004. It is well adapted to NC and has some resistance to Golden Nematode, Powdery Scab, and Common Scab. In the future we will continue to include this variety as it my have potential in a portion conscious environment, and provide a viable baking alternative to the large russets commonly available in stores. In future trials we intend to continue breeding and selecting new specialty-type lines as well as to look for small “B-sized” reds such as B2066-6 and B2079-6. gravity of potato clones harvested 110 DAP1 (102 DVK1) at James Brother’s Farm, Weeksville, Pasquotank Co., NC – 2004. B1806-8 269 223 86 84 127 81 16 3 1.063 . .
B1816-5 303 239 92 91 133 75 23 2 1.062 . .
Cherry Red 236 184 67 68 98 78 16 6 1.061 . .
Chieftain 297 197 72 73 100 65 14 20 1.05 . .
NorDonna 239 121 42 45 63 49 22 29 1.052 . .
NY125 330 273 97 100 149 82 14 4 1.062 . .
NY126 211 156 59 59 79 71 15 14 1.057 . .
NY129 234 161 59 59 96 67 25 7 1.051 . .
Vivaldi 280 170 57 61 92 56 35 8 1.053 . .
Yukon Gold 311 284 104 100 158 91 7 2 1.067 . .
2 Size classes: A’s + B’s > 1 7/8″; C’s ≤ 1 7/8″; Culls = all defective potatoes. 3 Determined by weight in air/water method. 1 = no defects, exceptionally bright; 2 = excellent, bright; 3 = good, light or golden; 4 = dark defects, marginal; 5 = not acceptable. 2 See NE184 Standard Potato Rating System for key to scores in Appendix 2. B1816-5 236 169 79 79 71 27 1 1.070 . .
MSI005-20Y 243 166 75 76 67 31 2 1.061 . .
ND3196-1R 142 63 28 29 44 32 24 1.059 . .
NY125 259 175 79 82 68 31 1 1.066 . .
NY126 253 219 99 102 87 13 1 1.073 . .
NY129 229 147 66 69 64 34 2 1.058 . .
Vivaldi 273 178 79 83 63 36 1 1.064 . .
Yukon Gold 258 214 98 100 83 9 8 1.071 . .
2 See NE1014 Standard Potato Rating System for key to scores in Appendix 1. Amey 168 122 84 22 55 17 0 0 5 72 17 . Michigan Purple 182 144 96 11 42 36 0 0 11 78 36 .
gravity of potato clones harvested 100 DAP1 at the NC State University VGJREC/NCDA TRS, Plymouth, Washington Co., NC – 2004. 2 Size classes: 1’s < 1 7/8″; 2’s 1 7/8 to 2 1/2″; 3’s 2 1/2 to 3 1/4″; 4’s 3 1/4 to 4″; 5’s ≥ 4″; Culls = all defective potatoes. tuber external and internal attributes of potato clones harvested 100 DAP1 at the NC State University VGJREC/NCDA TRS, Plymouth, Washington Co., NC – 2004.